Arbitrage betting, also known as ‘arbing’, is a method where you cover all outcomes of an event to guarantee a profit whatever the outcome. If you have done matched betting before then you’ll be used to placing back bets at a bookmaker and lay bets at a betting exchange. Arbing and matched betting aren’t that dissimilar with the main difference being that with arbing, you don’t have to use any free bets or bonuses in order to generate a profit. A lot of people who get involved in arbing start off with matched betting. If you haven’t done matched betting yet then I recommend you try it before you get into arbing as it will give you a good understanding of the basics of backing and laying bets and you’ll be able to build up a good-sized bankroll which will come in very handy for when you start arbing. Another reason to do matched betting before arbing is that the majority of bookmakers give new customers free bets and bonuses when they register. You’ll want to make full use of these free bets and matched betting allows you to extract the maximum profit possible from them. As arbing doesn’t require you to use free bets, it’s best to take advantage of these one-time offers through matched betting. Arbing, or it’s full name, Arbitrage betting, is betting on all outcomes of an event where the odds are favourable so that you return a profit no matter what the outcome is. You can find arbs on any sports and some don’t even require you to use a betting exchange. If you’ve done matched betting before you’ll be familiar with this method. You simply back a selection at a bookmaker and then lay the selection on a betting exchange such as Betfair or Smarkets. In order for you to guarantee a profit from the bets the back odds must be greater than the lay odds. If they are then you will return a profit whatever the outcome. You can see in the image below that Bet365 are offering odds of 13.0 for Heather Moth to win in the 16:20 at Limerick whereas Matchbook are offering odds of 11.5 for Heather Moth not to win the race. 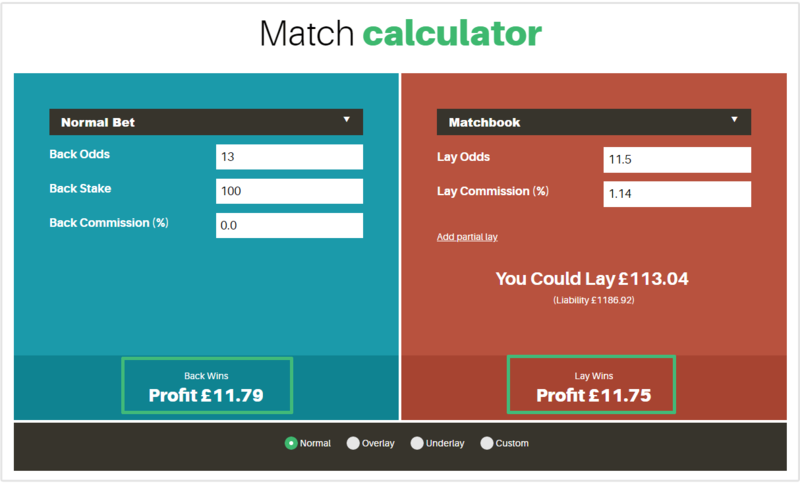 Using a matched betting or arbing calculator, you can work out your lay stakes so that you return a profit whether the horse wins or loses. In the example below we would make £11.79 profit if Heather Moth wins or £11.75 if Heather Moth loses when placing a £100 back bet. You can also find arbs without the need for a betting exchange. This method doesn’t work with all sports such as horse racing but works well when there are minimum outcomes of an event such as in tennis betting where there are only two outcomes. Either 'Player 1' wins or 'Player 2' wins. Bookmaker one has slightly higher odds on Player 1 winning compared to bookmaker 2 but has lower odds on Player 2 winning. If we placed a bet on both players at the same bookmaker we would make a loss. However, if we placed a bet on Player 1 at Bookmaker 1 and a bet on Player 2 at Bookmaker 2 we are able to make a profit no matter which player wins. There are plenty of arb calculators available on the web for free but you can use a simple formula to check if there is an arb opportunity with an event you have found. Using the equation below, if the Arbitrage % is less than 100% then you have yourself an arb. If you enter the odds for outcome A and outcome B from one bookmaker you’ll see that the Arbitrage & is greater than 100%. Anything above 100% is the bookmakers edge. We’re looking for a percentage below 100% so that we have the edge. We can see that because the Arb % is below 100% we have an arb and our edge is 4.37% (100% - 95.83%). Therefore, if we place £100 worth of bets across the two outcomes, we will make £4.37 profit. A simple equation will display the amount of profit you’ll make from an arb when you have calculated the Arb %. Again, you can use an arbing calculator for this but this is how it is done manually. There are various ways to calculate your bet sizes when arbing depending on whether you want to make a certain amount of profit or have a total amount you have available to bet. To calculate your stakes on each outcome based on a total investment you can use another equation. There are a few ways to find arbs which we will go through in a bit more detail. Some methods are free while some cost money and some are quick and easy while others take time. It's best to explore all of these arb finder options to see which you are most comfortable with. If you've done matched betting before then you will have used an odds matcher. Odds matchers compare the odds at bookmakers against those at betting exchanges and display them in order of value. Using a odds matcher from a matched betting service is a quick and easy way to find arbs as many can be found with the click of a button. Matched betting services don't encourage users to arb as you're essentially taking value from the bookmakers. If you do this too much you are likely to have your account restricted and you won't be able to place stakes large enough for it to be worthwhile arbing. This is known in the matched betting world as being 'gubbed'. We've written an article on gubbing which can be found by clicking here. It contains useful information on what gubbing is and how you can take measures to avoid being gubbed. 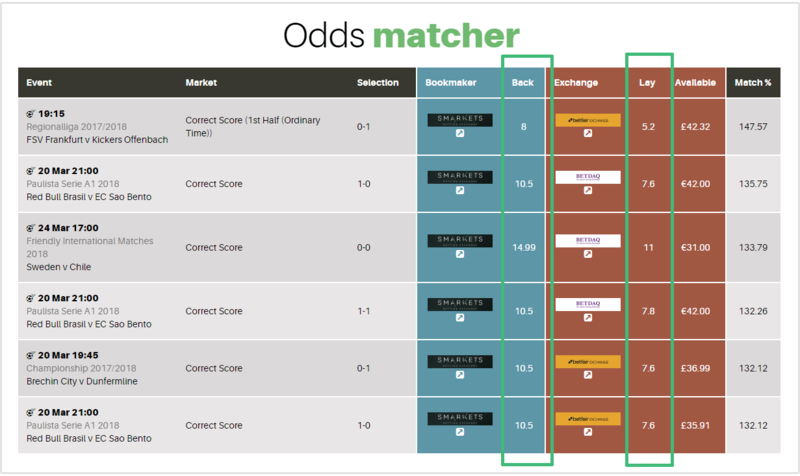 Below is a screenshot of the odds matcher at MatchedBets.com. Most other top matched betting sites have odds matchers which can be used for arbing also such as OddsMonkey and Profit Accumulator. You can see that all of the selections have back odds which are GREATER than the lay odds. Backing and laying these events would result in a profit. 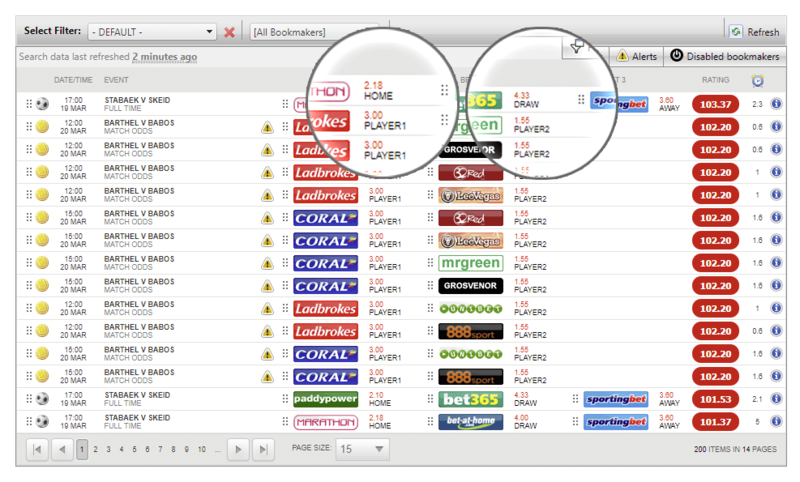 You may not be able to find bookmaker-only arbs using some odds matchers but some matched betting sites provide 'Dutch Matchers'. These will display arbing opportunities which don't necessarily require you to use a betting exchange. Below is an screenshot of OddsMonkey's Dutch Matcher which shows some profitable arbs on football and tennis matches. A profit can be made by simply betting on one player at a bookmaker and betting on the other player at another. Football matches require you to place bets at three bookmakers since there are three outcomes (Team 1, Team 2 and a draw). It is possible to find arbs manually although it does take longer than using automated tools and it does require an eye for determining which set of odds could potentially be profitable. The best way to find arbs manually is to use an odds comparison site such as oddschecker.com alongside a betting exchange. Open up a marketoin OddsChecker.com and the same market on the betting exchange. You want to be looking for instances where the odds on OddsChecker.com are greater than the odds displayed on the betting exchange. It's best to have the two windows open side by side or on different screens so that you can glance between the two sites quickly. This can be a very tiresome process but you may be able to find arbs that others haven't which may be less likely to raise a red flag with the bookmaker. Above is an example of an arb which has been found manually via an odds comparison site and a betting exchange. You can see that the odds listed on OddsChecker for Petty Patch to win are 8.0 on Bet365 and the odds on Smarkets for Petty Patch not to win are 7.4. By backing this horse to win with a £100 stake and laying the horse with a £108.40 stake would return a £6.24 profit whether it wins or loses. Arbs may not be as profitable than when using automated software. There are a number of software solutions aimed solely on arbitrage betting which provide users with a number of arbing opportunities which are unavailable by manually finding arbs or by using matched betting software. Arbitrage betting software generally finds a lot more arbs than using matched betting software and A LOT more than if you were to find them manually. They cover a range of sports and the odds are generally updated a lot quicker. Some of the most well-known and popular arbing software includes Rebel Betting, Bet Slayer, Bet Burger and OddStorm. We'll go into more detail about each of these arbing solutions in another article to find out what the best arbing software is. Arbing software comes at a price and it's best to do your research into each product before committing. Some are aimed at professional arbers while others are more user friendly and may appeal more to those just getting started with arbing. You can generally expect to pay between £50-£100 a month for basic packages and up to £350 a month for VIP packages which can include in-play arbs. In-play arbs are not for beginners as you have to be very quick playing both back and lay bets and it is possible to lose a lot of money if the odds shift ,which they can do very quickly in-play. You may be able to find free arbitrage software but they generally aren't worth the effort as they won't display all of the available arbs and often have a delay in refreshing the odds meaning that it is likely they will have changed before you have the chance to place your bets. However, if you are considering using arbing software, it may be worth seeing if they have a free trial available. Although the free trial may not give you access to all of the features or arbs, it will give you a feel for how the software works and if you will be able to get to grips with it. It's no surprise that bookies don't like people arbing. Any bet takes value away from them is a black mark against your account and if you do it too much you may find your account restricted or even closed. Things like participating in promotions, claiming free bets along with arbing all give value back to the customer. Bookmakers offer free bets and promotions to entice customers to come back to their site and use it more but they don't like you taking advantage of too many of them. That is why we recommend taking measure to protect your accounts when matched betting. It's not hard for bookmakers to spot people arbing. Their trading teams are pretty quick and changing their odds when they notice that they've changed on the exchange but they do slip up which is when there are arbing opportunities. If you are placing bets on markets where their odds are greater than the exchange they will eventually catch on unless you take measures to stay under their radar. Below is a typical email you may receive when a bookmaker finds out you have been arbing or matched betting. Your bookmaker accounts are precious as you are only allowed one and so it is important to do all that you can to prevent account restrictions. There's no foolproof way of avoiding a gubbing. If there was then we'd all be taking full advantage of matched betting and arbing forever. However, there are ways which can reduce your chance of being gubbed which should be practiced when both matched betting and arbing. Every bookmaker is different and has different ways of analysing their customers bet activity. The best way to stay under the radar from a bookmaker is to look at your bet activity from an outsiders point of view and ask yourself if it looks natural. Finding arbs where you can make £5 profit from a £100 bet aren't unusual and probably mean that the bookmakers haven't gotten around to updating their odds yet. These are the arbs that you should be taking advantage of. However, every now and again you'll come across an arb where the odds between the bookmaker and exchange vary greatly. There is a good chance that the bookmaker has made a mistake is displaying their odds and despite what a lot of people think, they are within their rights to cancel bets should odds be displayed incorrectly. If you have placed a lay bet and your back bet gets cancelled, you could end up losing a lot of money as well as showing the bookmaker that you are arbing. Betting on markets such as the Premier League, Wimbledon and the Grand National are something most bettors do. However, if you suddenly start placing large bets on the Ukrainian second division or a basketball game in Japan then it's likely your account will get flagged and looked at eventually. There won't be many people betting on these markets and it's easier for bookmakers to single your account out than if you are one of the ten million betting on the FA Cup final. However, that being said, you also want to find arbs which the masses aren't taking advantage of. Try to look for arbs on sports such as boxing, formula one, tennis and golf. People still place lots of bets on these sports but they are less popular among some arbers who use basic arb finding software. Most casual arbers only use the bigger bookmakers to place arbs. They may already have funds in those accounts and it's a lot less effort keeping track of money in a handful of accounts than a hundred. However, some smaller bookies display similar odds to the larger ones and so you may be able to find the same arbing opportunities at a lesser-known bookmaker. An advantage of this is that is your account does end up restricted, you won't lose one of your main accounts. Mug betting is one of the best ways to look like a normal punter which is what the bookies want. If a bookmaker looks at your account and sees only bets on random sports and markets they are going to be suspicious. However, if those bets are surrounded by regular punts on the Premier League or big sporting events then you have a much better chance of them not spotting your arbing activities. An example of how to look like a regular punter is to bet regularly on your favourite football team. If you are from Newcastle, place a bet on them each week. You can either lay these bets off for a small loss or take the chance on them winning. Even though to may make a loss each time you lay these bets off, you will make a lot more profit in the long run by having your accounts remain open. The term 'sharbing' means placing arbs in a betting shop. Where you would usually place arbs online through your online bookmaker accounts, sharbing allows you to place your bets directly in-store allowing for further arbing opportunities. The main advantage of sharbing is that you can't get gubbed. However, if a member of staff suspects that you are sharbing then they may politely ask you to leave and so it is important to disguise your activities the best you can. Sharbing is less popular than arbing online as it takes more effort given that you have to physically visit a betting shop in order to place bets rather than sitting on your couch with your laptop on your lap. However, sharbing allows for greater opportunities to generate profits and is worth taking a look at the next time you're around a betting shop. The odds in a betting shop are usually displayed on paper sheets for various events and so it is much more of an effort for the shop to replace these sheets should the odds change. Therefore, it is possible to find very good arbs for the in-store odds compared to the online betting exchange. If you wish to try sharbing, I advise you to pick up a few of the sheets which list the odds the next time you pass a betting shop. You can usually pick up sheets that display the odds for football matches for the whole weekend and so there is a good amount of data on them. Take those sheets home and compare the odds to the same markets on a betting exchange to see if there are any arbs. Once you get the feel for how it works you can start checking the exchange odds while in-store or in a coffee shop close by so if you do find an arb, you can place the bet quickly. If you are checking the exchange odds while in-store, be very careful that you are not seen doing so by staff members. They know what to look out for with customers and comparing in-store odds against betting exchange odds is a clear sign you are sharbing.